On the first day (September 11), more than 100 participants including representatives from the National Academy of Agrarian Sciences of Ukraine and the leading scientists of the Institute of Irrigated Agriculture of the National Academy of Sciences of Ukraine, the Institute of Water Problems and Land Reclamation of the National Academy of Sciences of Ukraine, “Askaniyske” and “Brylivske” farms, Kherson State Agrarian University, Mykolaiv National Agrarian University, Dnipropetrovsk State Agrarian and Economic University, Research Institute of Agriculture of the Crimea,” The Ohio State University, Ministry of Agrarian Policy and Food production of Ukraine, Kherson Regional State Administration, Kherson Branch of the State Agency of Ukraine, Kherson Branch of Soil Protection, Ukrainian Hydro-meteorological Center of the Ministry for Emergencies, heads and agronomists of farms in the southern region of Ukraine, and several participants from other countries attended. The event took place at the Institute of Irrigated Agriculture, Naddniprjanske village, Kherson, Ukraine. Several professional presentations were delivered by scientists, farmers, agro-industry personnel, and faculty members. Drs. Rafiq Islam and Natalia Didenko presented the CRDF-funded project results based on a first-year field study on the topic of Agriculture under Climate Change in Ukraine. More than 50 participants attended a field day and presentation on climate-smart agriculture in Ukraine; it was delivered at Askaniyske Farm (Tavrychanka village, Kakhovka district) on the second day (Sept 12th, 2018). Several professional presentations were delivered by OSU experts including Alan Sundermeier from Wood County Extension on long-term no-till, cover crops, compaction and soil health; and Dr. Tom Worley on economics of crop production with no-till. After the professional presentation session, the participants visited our research and cover crops site. 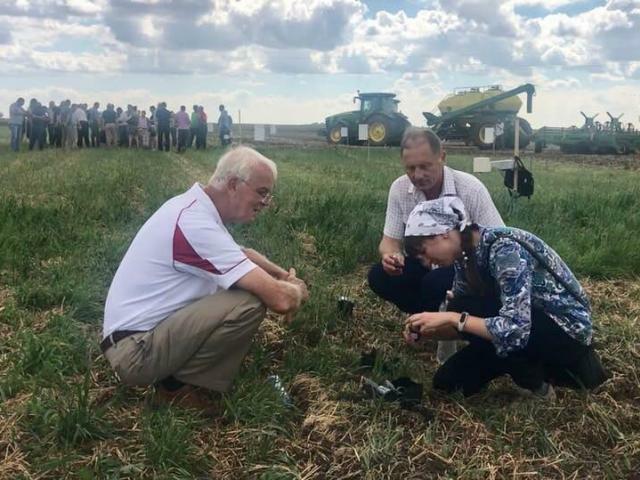 Several demonstrations on equipment, cover crops, on-site soil quality evaluation, and use of drones to monitor crop growth and disease pressures were performed.